With two new suite-style residence halls that “can compete against any in the nation,” Eastern Kentucky University is experiencing an upsurge in students choosing to live on the Richmond campus. The two new residence halls are not the only new facilities that will welcome EKU students this fall. The second phase of the University’s New Science Building also opens, as well as the Eastern Scholar House for single parents. In addition, a new 320-space parking garage, the first at Eastern, is expected to open shortly after the fall semester begins, and Case Dining Hall will open in January 2018. It’s all part of the University’s ongoing revitalization initiative, designed to transform the living and learning experience for EKU students. Together, the two new residence halls, North Hall (at the intersection of Kit Carson Drive and Madison Drive) and New Martin Hall (at the intersection of Lancaster Avenue and Park Drive), will house 1,137 beds. Both residence halls were financed via a public-private partnership, with no taxpayer dollars involved. According to April Barnes, executive director of housing and residential life, both of the new halls are expected to be at or near 100 percent occupancy by the beginning of the fall semester. In all, housing applications for this fall total 4,558, up from 4,450 a year ago. Among other students, New Martin Hall will house Honors, Justice and Safety, and Professional Golf Management living/learning communities. The former Martin Hall opened in 1962. North Hall will include Panhellenic sororities. Some lucky residents of New Martin Hall have an added bonus: a westward view that looks out over the newly completed Carloftis Garden, also made possible by a public-private partnership. Data shows that students who live on campus are more likely to persist to graduation. As the University brings its two new halls online, two residential facilities built in 1964, Todd and Dupree, will be razed beginning Aug. 2 and continuing into early October. A new, much larger, student recreation center, financed by a student fee approved by the Student Senate in 2015, will be built on the former site of the two halls. Construction on the new rec center will begin this fall and is expected to be complete by Fall 2019. To follow progress at the site, visit https://goo.gl/ByUpYt. 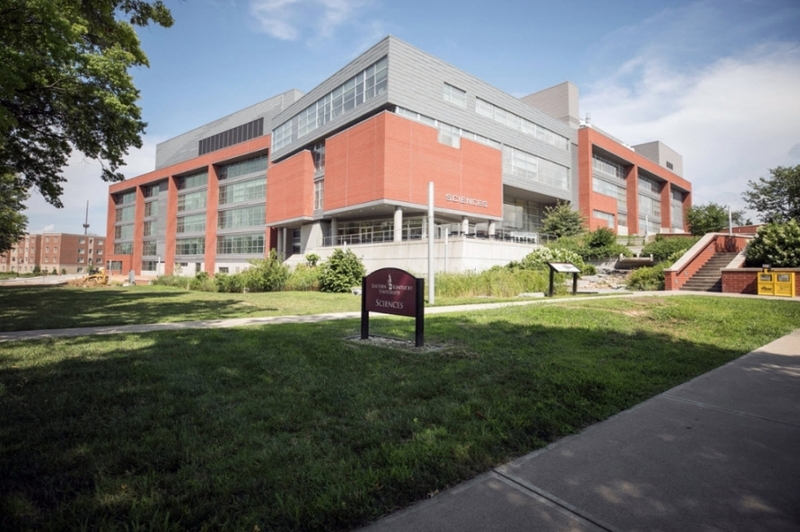 The completion of the New Science Building, adding the departments of biological sciences and geosciences and giving Eastern the largest such facility on any campus in Kentucky, is expected to make the University even more competitive for faculty, make graduates more competitive in the workplace and help address deficits in STEM disciplines throughout the Commonwealth and nation. The Eastern Scholar House, owned and operated by Eastern Scholar House LLLP, represents a partnership with state federal agencies, the City of Richmond and the Kentucky River Foothills Development Council (KRFDC). The project will provide services including case management, life skills, etc., and access to subsidized housing and childcare for single parents committed to furthering their education. The University provided a long-term land lease for the property, located on the eastern periphery of campus just east of the science and health sciences complexes, as well as access to services and amenities; the Kentucky Housing Corporation was the primary funder; and KRFDC will manage the facility. Case Dining Hall, under construction now on the former site of Case Hall and Annex, is financed by Aramark Educational Services LLC as part of a $37 million agreement signed last year that ensured the firm would provide dining services for the campus for the next 15 years. The first floor will feature retail food options; the second floor will feature an all-you-can-eat main dining hall; and the third floor will house offices, small classrooms and a multipurpose room. Once Case Dining Hall is operational in January, renovations will begin on the Powell Student Center, with expected completion in late 2019. The Powell project is financed by the same student fee as the recreation center. Recent and ongoing improvements to several athletics facilities, financed by agency bonds and private donations, include a 3,000-seat east-side grandstand at Roy Kidd Stadium. The facility also includes concessions, restrooms and locker room facilities. Freshmen will begin moving in on Wednesday, Aug. 16, and the first day of classes will be Monday, Aug. 21. With the addition of the parking garage and other new spaces scattered around the campus, students will have more parking options from which to choose this fall. Details regarding dedication ceremonies for the new facilities will be announced soon. Inset photo: New Martin Hall, with Carloftis Garden in foreground.